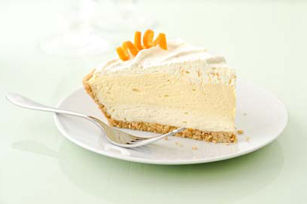 Sweetened cream cheese, vanilla pudding and the zest and juice from an orange give this Sunshine Pie its sweet and citrusy appeal. EAGLE BRAND is a registered trademark of The J.M. Smucker Company. Beat cream cheese and 1/4 cup condensed milk with mixer until well blended. Whisk in 1/2 cup COOL WHIP. Spread onto bottom of crust. Whisk orange juice, remaining condensed milk and dry pudding mix in medium bowl 2 min. Stir in 1-1/2 cups of the remaining COOL WHIP. Spread over cream cheese layer. Stir orange zest into remaining COOL WHIP; spread over pie. Refrigerate 4 hours. Since this luscious no-bake pie makes enough to serve 10, it's the perfect dessert to bring to your next gathering. To add a simple citrus fan garnish, cut additional orange, lemon or lime into thin slices. Stack 3 slices. Cut slit through slices to center. Twist slices from slits in opposite directions; twist 3 slices together for fan effect. Pie can be stored in refrigerator up to 8 hours before serving.